SANTA CLARA, CA--(Marketwire - September 30, 2010) - AMIMON, the market leader in wireless HDTV semiconductor solutions, announced today it has been selected by Galaxy Microsystems for its upcoming Galaxy GeForce GTX 460 WHDI Edition wireless PC-to-TV connection and graphics cards. The Galaxy GeForce GTX 460 WHDI Edition is based on AMIMON's WHDI technology and will enable users to wirelessly connect their desktop/tower PCs to their TVs. The Galaxy GeForce GTX 460 WHDI Edition will be available in October this year. Additionally, Galaxy has announced that it will join the WHDI™ (Wireless Home Digital Interface™) consortium as an adopter. AMIMON's WHDI technology has no noticeable latency (less than one millisecond) making it an ideal solution for gaming. The no-latency link enables consumers to enjoy full interactive PC applications on their TV. The AMIMON based Galaxy GeForce GTX 460 WHDI Edition provides an uncompressed wireless PC-to-TV connection enabling consumers to view the entire content of their PC screen on their TV. Content such as Internet video, flash media, digital photos and PC games can all be viewed and experienced on the TV with a convenient wireless connection. The AMIMON based Galaxy GeForce GTX 460 WHDI Edition will enable a simple and easy connection between a PC and any TV. 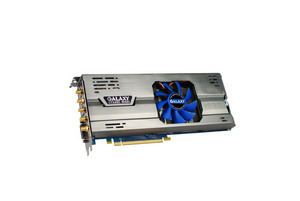 The Galaxy GeForce GTX 460 WHDI Edition is easily integrated/plugged into a tower or desktop PC. The graphics card embedded with AMIMON's WHDI technology comes with a receiver adapter that plugs into the TV. "Gamers and PC users alike want to take the PC games and content from a small monitor to the superior image of an HDTV," said Alex Lam, CEO of Galaxy Microsystems Ltd. "Fusing Galaxy's high-performance graphics cards with AMIMON's WHDI technology provides gamers and consumers with the highest quality wireless HD video connection." "Teaming with Galaxy introduces AMIMON's WHDI technology to the gaming community; with Galaxy and the WHDI technology gamers will be able to maximize high-quality HD graphics of HDTVs utilizing an uncompressed HD wireless link," said Shimon Greenberg, vice president of sales for AMIMON. "AMIMON's WHDI technology is gathering tremendous momentum across the consumer electronics ecosystem: gaming, PC-to-TV, wireless HDTV, etc." AMIMON's wireless technology is the basis of the WHDI™ (Wireless Home Digital Interface™) standard. The WHDI standard delivers uncompressed wireless 1080p 60Hz video (in a 40MHz channel in the 5GHz unlicensed band) providing consumers with the most robust and highest quality HD wireless connection for in-room and multi-room applications. WHDI has a range of 100 feet (30 meters) through obstacles and walls enabling consumers the freedom and hassle free way to connect sources anywhere with-in a room or enable multi-room connections. Additionally, the WHDI technology implements HDCP revision 2.0 enabling wireless viewing on the TV of all PC content including Blu-Ray movies and DRM protected content. AMIMON is a leading provider of wireless high-definition video semiconductor solutions for universal connectivity among CE video devices. AMIMON is a founding member of the Wireless Home Digital Interface (WHDI) consortium formed by leading CE companies to define a new industry standard for multi-room wireless HDTV connectivity.